Dear Lord, let the people you love most live in this land! I often saw where this old Bavarian prayer was coming from while savoring its beautiful mountains and old towns. 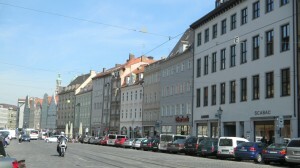 Of Bavaria’s towns, Augsburg has been one of the most prosperous. Even in the Middle Ages, visitors spread word about its riches. It was a key trading hub between Italy and the rest of Germany, so some very cool things happened there when the Italian Renaissance blossomed. Many merchants and bankers in Augsburg did business with Venice. So as Venetians commissioned lots of great art with their boat-loads of money, people in Augsburg imitated them. The abstract lines and geometrical forms from Italy’s classical heritage were signs of prestige. So the good folks of Augsburg gave their city a Renaissance makeover. No space in Augsburg has been more public than Maximillian Strass. 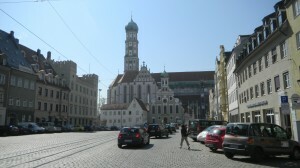 It runs from the gorgeous basilica (St Ulrich and St Afra) in the above picture to its main town square. This was THE place for wealthy merchants to show off their new homes in the 16th century. Even the greatest northern European bankers of the time, the Fugger family, lived on it. The street’s width and stately homes make it resemble Venice’s Grand Canal. 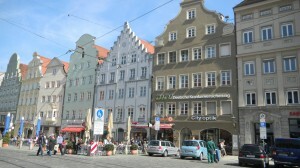 Many of Augsburg’s citizens in the 16th century competed with their southern neighbor. 1. They built homes with wide frontages, which sported clear lines of large and straight windows. 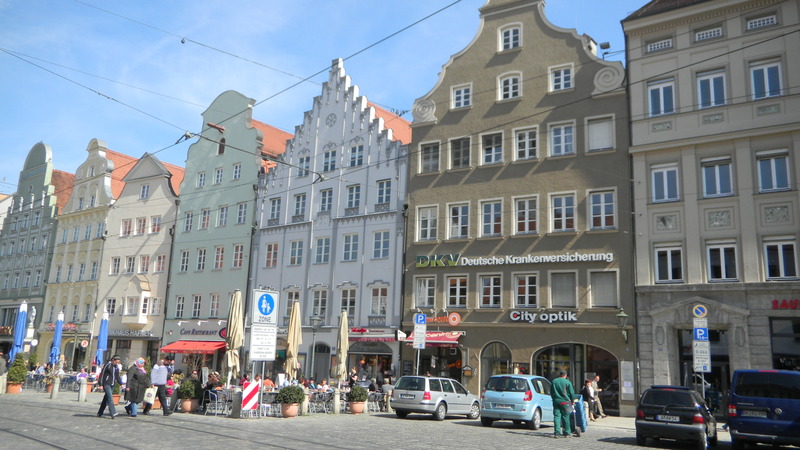 Like Venetians, Florentines and Romans, people in Augsburg were stressing the abstract line and reinforcing Western culture’s assumptions that it’s a key basis of nature and society. Merchants cities in Italy and north of the Alps associated it with social prestige and personal well-being–the rabble live in artless hovels. 2. But they blended these abstract forms with German culture. You don’t see any Roman arches in the photo. The windows are straight and orderly, like honest German merchants. Their owners were projecting themselves as people you can trust. 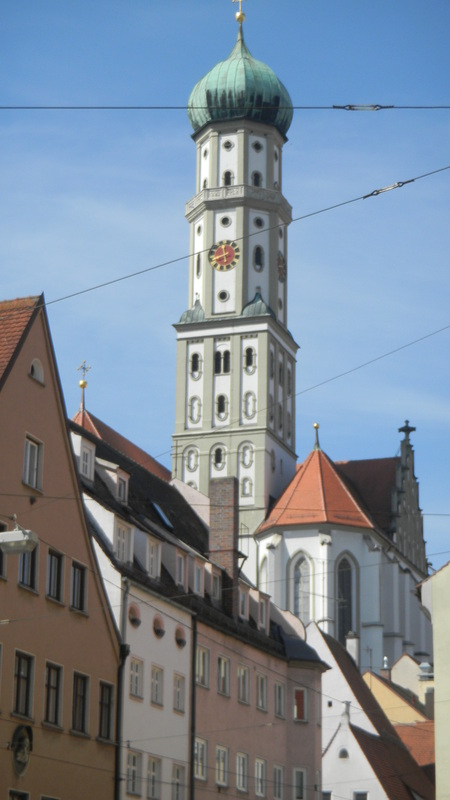 During the Protestant Reformation, most people in Augsburg converted to the new faith, and they wanted to distance themselves from Rome. But they were still Western. 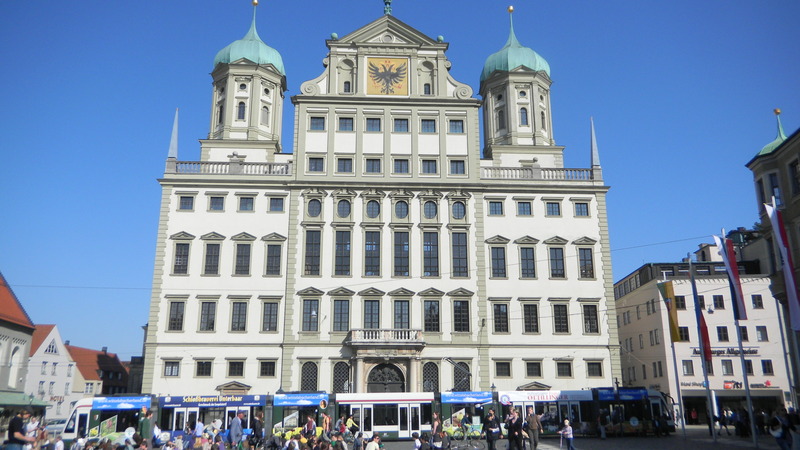 So when Augsburg decided to build a new town hall at the other end of Maximillian Strass in 1609, its leading citizens approved the above design in which linear arrangements of tall and straight windows dominate everything but the crown. 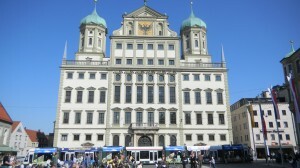 The people of Augsburg did make the crown fanciful. They did this in many of the homes in the picture above the hall too. A lot of German art has a split personality–a dialectic between orderliness and dreaminess. You can also see this in the first photo in this post. 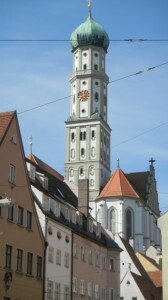 The tower of St. Ulrich rises in clear linear sections and transforms into a more whimsical onion shape. So people in Augsburg were inspired to imitate Venice, but they expressed classical arrangements of abstract lines in their own language. In the process, they added yet more variety to Western culture. A simple abstract line holds infinite riches! Want to fly even higher than the upper floors in the pictures? Explore Islamic culture’s concepts of geometry and you’ll find yet more riches.